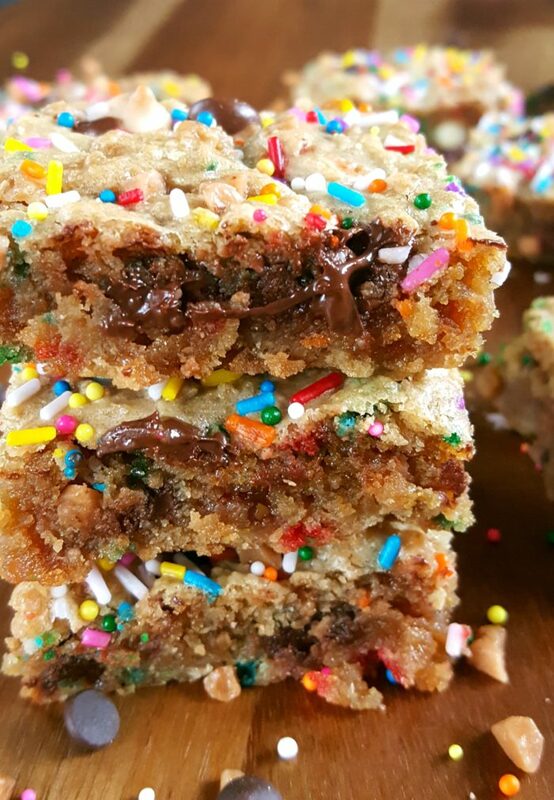 These homemade Blondies taste like decadent cookies in bar form. They’re chewy, a little gooey, and such a simple but tasty dessert. Easy to make, quick to bake, and the perfect base recipe to customize however you want! 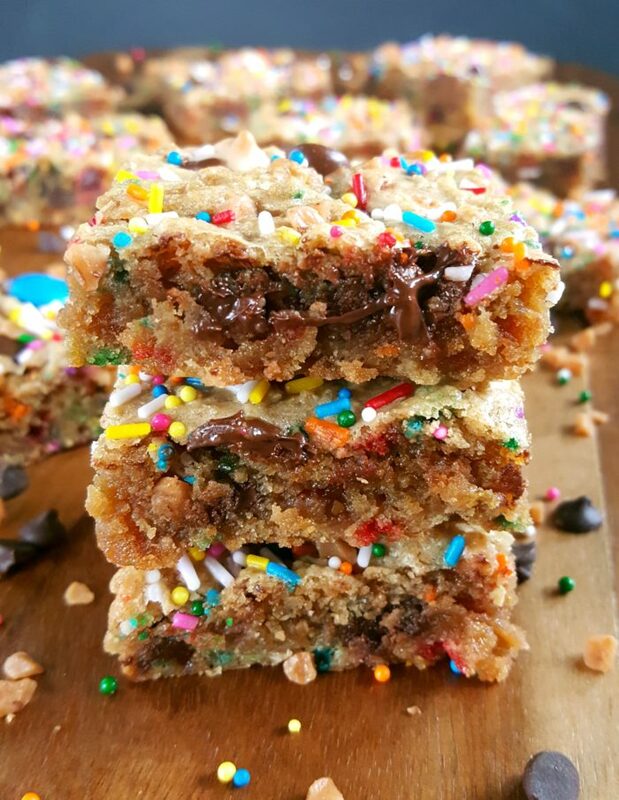 Blondies are basically the blonde version of chocolate Brownies. They’re typically made with flour, butter, vanilla extract, eggs, baking powder, and mix-ins. 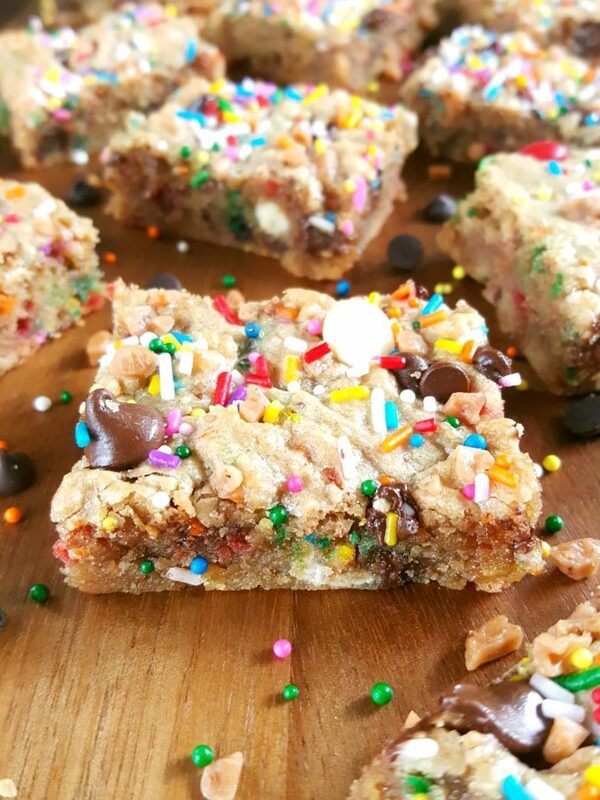 They’re part cookie, part bars and a whole lotta yum. There are no leavening ingredients in this recipe though because we don’t want the bars to rise. We’re going for a chewy texture after all. 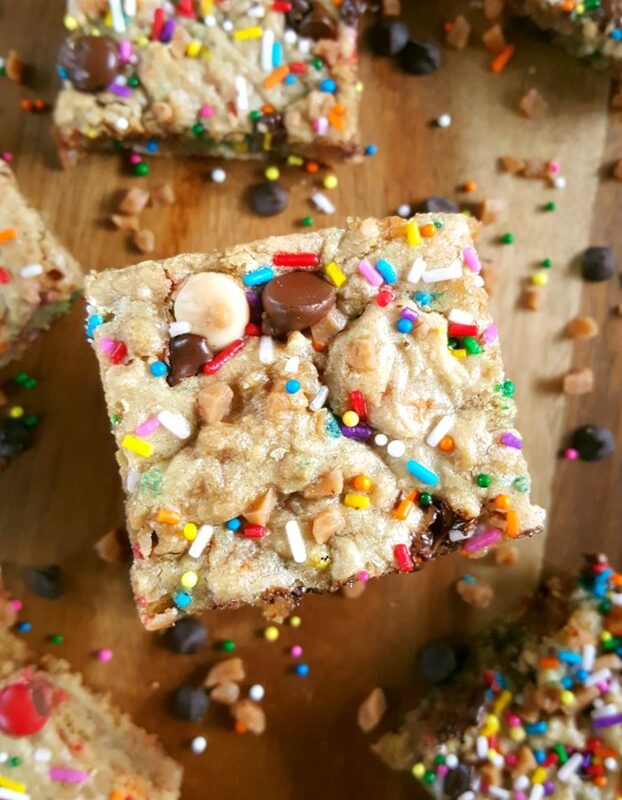 This recipe yields a small batch – 12 blondies, 9×9 inch pan. So it’s perfect for when you want a quick treat with no fuss. It’s one of the quickest and easiest desserts you’ll ever make. It’s like making cookies but without having to do all the extra work. This recipe is basically foolproof. It never fails me, ever! I’ve made it countless times now, many different ways, and it always turns out great. 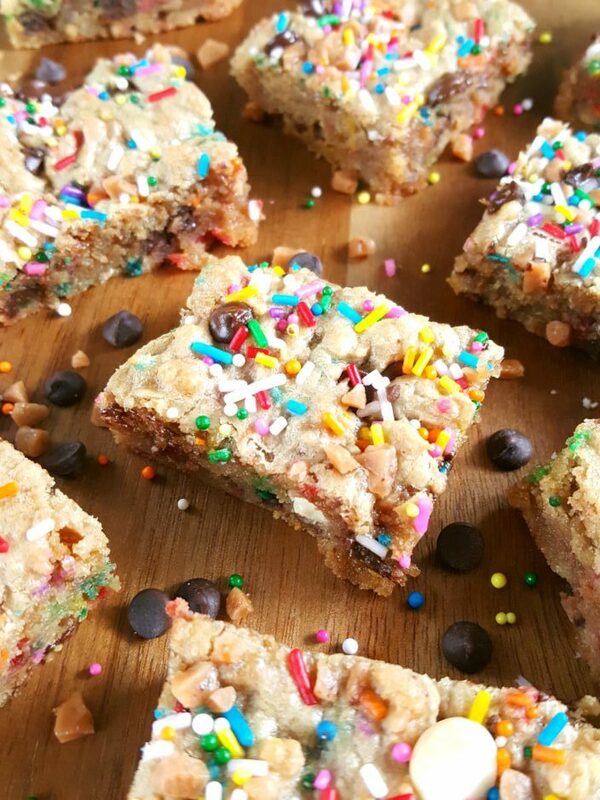 These Blondies are for those days when you want a treat that tastes incredible without having to do all of the incredibly hard work. They’re for those days when you don’t have the patience to measure out a ton of ingredients. Or those days when you don’t want to mess up and wash a bunch of dishes. Or those days when you don’t care if you get chocolate all over your fingers. For those days, these bars are perfect. I never thought that these would turn out so great considering the butter to flour ratio. But that and the brown sugar is exactly what makes this the best chewy blondies recipe ever. And I mean it. I try to use the word “best” sparingly on this blog because often times I find that a recipe can always be made better. So when I do use the word “best” it means that to the best of my knowledge there is absolutely nothing that can be done to make the recipe any better than it already is. This is a simple recipe with a few simple ingredients and it works. 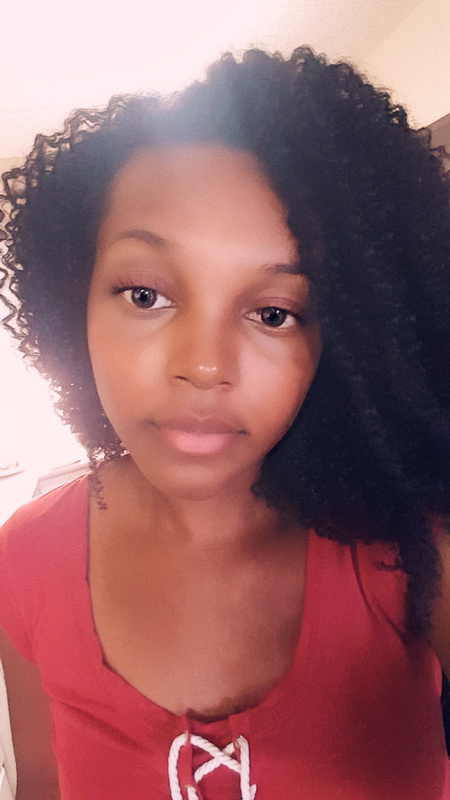 You can even add a mixture of things like I did. The possibilities are endless. Preheat oven to 350°F. Line a 9×9 inch baking pan with parchment paper or foil and set aside. In a large bowl combine the butter and brown sugar. Beat in the egg and vanilla extract until mixture is smooth. Add flour and salt and gently stir until incorporated. Fold in the mix-in ingredient. Spoon the dough into the baking pan, spreading it into an even layer. Bake for 17 – 18 minutes. Cool in pan for at least 20 minutes before slicing. I love that you don’t have to chill the dough or scoop and roll cookies. You just mix, press, and bake! It’s the perfect easy baking recipe for beginners. It’s very hard to mess it up. You’ll need to line the pan with parchment paper to keep the batter from sticking to it but if you don’t have parchment you can always use foil paper. The bottom and edges of the bars may be a little bit crispier but still just as delicious. The batter is thick and a little sticky and it will seem like there’s not enough to cover the bottom of the pan but just take your time and spread it. It will work. I promise. 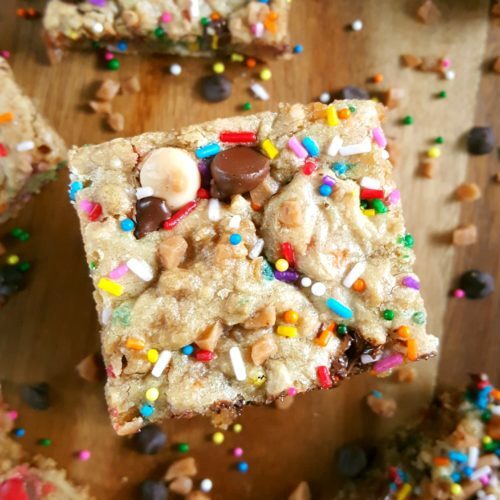 Do not over bake these blondies! Under baking these bars is key! So watch out for golden edges that are set and a slightly crackled top. That means the bars are done. The majority of the center will be under baked but it’s going to continue “baking” and firm up as it cools in the pan. These bars are rich. They’re richer than your average cookie so pace yourself (if you can). The crisp buttery edges and the super soft, chewy centers are just amazing. And the raw dough is heavenly by the way. I know I’m not supposed to eat it but I could not resist. 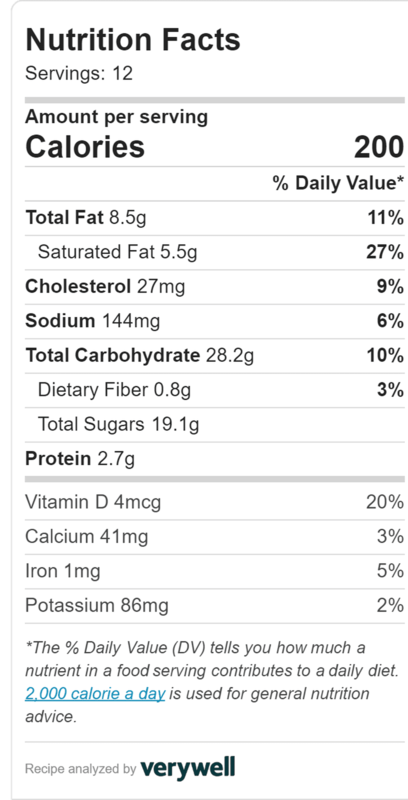 Brown sugar seems to be a weakness of mine. I cannot even begin to tell you how good these are when they’re warm, especially with some vanilla ice cream on top. You can also have them with a tall glass of milk; whatever your fancy. This is definitely one of those comfort food dessert recipes that you want to keep in your back pocket. It’s very easy to memorize and it’ll only take you trying it one time for it to become one of your go-to recipes for dessert. So have them sooner rather than later! If you don’t plan on eating them right away remember to cover them up and store them in an airtight container or a food-safe resealable bag. If stored correctly they should keep at room temperature for to 4 – 5 days. *Note that if using foil the edges may brown/crisp quicker. Bake for 17 - 18 minutes. DO NOT over bake. *Bars are done when the edges are golden brown, the top is slightly crackled, and the center is soft and under baked. Cool in pan for at least 20 minutes before slicing. Serve warm or cooled completely.